Elder Predator is 8 1/4 inches (21cm) tall with 21 points of useful articulation. Elder Predator is based directly on film reference from Alien vs. Predator. Left wrist control panel open and closes. Predator has unmasked head with blue dreadlocks, all arm blades, detailed cape and shin-mounted holster with removable knife. Trophy necklace can be removed. Height: 8 1/4 inches tall. Articulation: Neck (ball joints), shoulders (double ball joints), elbows, wrists (left is ball-jointed), pectoral joints, chest (ball joint), waist, hips (ball joints), thighs, knees and ankles (ball joints). Total of 21 points of useful articulation. Accessories: Package includes fully detailed Elder Predator based directly on film reference from Alien vs. Predator. Left wrist control panel open and closes. 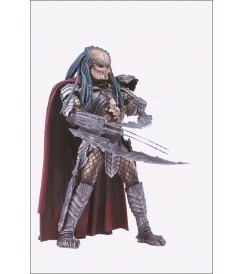 Predator has unmasked head with blue dreadlocks, all arm blades, detailed cape and shin-mounted holster with removable knife. Trophy necklace can be removed.